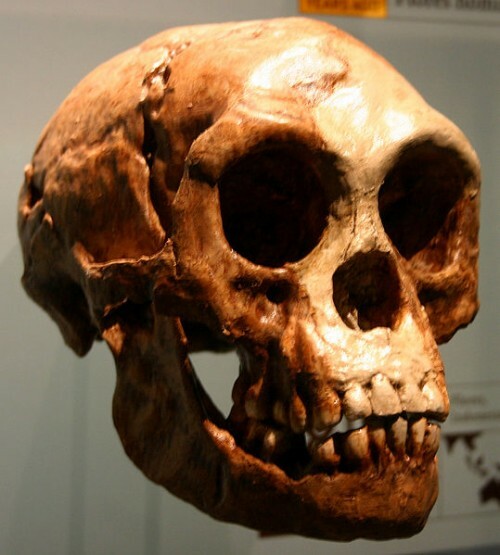 Homo floresiensis has been dubbed "hobbit" for its dimunitive size. Its existence until 17,000 years ago was surprising enough, but its probable ancestry is raising spellbinding questions. The original find was a cavewoman, about 3 feet tall, on the island of Flores in Indonesia. LB1 had an almost complete skull, and a partial skeleton that included leg bones, parts of the pelvis, feet, hands, and some other fragments. A number of other specimens of Homo floresiensis have been found since, dating from 38,000 to 17,000 years ago, when they are believed to have went extinct. Floresiensis is a well-established species of hominid. However, it has a small brain, even for its size. Its skull is very human-looking, but it has other traits that have raised some intriguing speculation. Where Did Homo Floresiensis Come From? Stone tools probably made by the hobbits have been found dating back 1.1 million years. There are even current claims that date will be pushed back to 2 million years. If Homo floresiensis descended from Homo erectus, as first assumed, then there was an unexplainable decrease in brain size, even relative to body mass. The Flores hobbits have several anatomical similarities to Homo habilis, a species which never left Africa. Brain size suggests they could have descended from Homo georgicus, an intermediate between habilis and erectus that was found in eastern Europe, but they bear more similarity to Homo habilis. If their tools go back to 2 million years ago, then the Homo floresiensis predates Homo georgicus. Homo floresiensis bears a lot of resemblance to both Australopithecus afarensis and Homo habilis. In particular, their feet are large, 70% of their femur as compared to 55% in modern humans; their wrist bones have a trapezoidal shape that would have made tool-making more difficult for them; and, of course, they had small brains. A recent study looked at both absolute and relative brain size in primate lineages using 37 current species and 23 fossil species. They concluded that a decrease in relative brain size over time is rare but does happen. If Homo floresiensis descended from Homo erectus, though, then the decrease in relative brain size is dramatic and unparalleled in primate evolution. Thus, the thought is that these hobbits descended from Homo habilis, which was already small in stature, and the decrease in brain size is almost non-existent, much more in line with what we see as possible in other primate lineages. The problem is that if Homo floresiensis descended from Homo habilis, then how did they get to Indonesia? Homo habilis is a purely African species, found only in the Great Rift Valley. One article I consulted suggests that as difficult as it is to believe that floresiensis left Africa and traveled to Indonesia, that is what must have happened. I can't buy it. My love of learning is primarily historical, and you just don't invent historical events for which there is no evidence. I vote for Homo georgicus or a yet unknown species as the progenitor of our tiny Flores cavewoman. Homo georgicus is intermediate between habilis and erectus, and georgicus fossils were unearthed at Dminisi, Georgia, in Eastern Europe. Now you've got a species that has already left Africa, and the decrease in relative brain size is still within norms for primate evolution. The decrease in body size would be accounted for by the fact that dwarfism is typical on islands, and the decrease in relative brain size would be a product of a million years on an island or islands in Indonesia without competition from other hominids. Brains require a lot of energy, so if they're not needed for survival, the decrease would be expected. What Became of Homo Floresiensis? One, there was an eruption in Indonesia around 17,000 years ago. Volcanic ash was found in the ground above the cavewoman find. Perhaps an eruption either suffocated the hobbits in ash or destroyed the island so they starved. The other possibility is that Homo sapiens showed up. We have a history of extinction following and surrounding us. Mammoths and Neandertal men would be examples. It's entirely possible humans showed up and used up their resources or took enough of their land that they could no longer survive. In our defense, there are still pygmy elephants, rats, and komodo dragons on Flores, which is what Homo floresiensis hunted. Thus, there is evidence against our driving them to extinction. Mike Morwood, the original discoverer, has reported that he has found stone tools at other sites that are up to 2 million years old. If that turns out to be true, then unless we find other hominin on the islands, Homo floresiensis certainly predates Homo erectus and possibly georgicus as well. Wouldn't it be amazing if it is in Indonesia that we find the first evidence for human ancestors outside of Africa!